Sling TV Cloud DVR option is now available for all subscribers. Keep in mind almost every channel, but not all can be recorded by the DVR service. Channels without DVR option includes NatGeo and Disney owned channels like ABC, ESPN and Disney. The Sling TV DVR Beta program originally started on December 15, 2016 for faithful customers who were streaming using Roku players. Early adopters had to email to be invited to participate in the beta program. Once you were selected, you were given 100GB of storage space and a chance to review the service along with the ability to give Sling direct feedback There was no cost associated with it. However, only certain streaming devices are capable of utilizing the DVR service. Currently, you can only use the DVR option on Roku and Android devices, including Amazon Fire streaming players, Apple TV but not all devices, including iPhone and Windows PC. Currently, Cloud DVR is available for most streaming devices, including Roku, Amazon Fire, iOS devices, Windows 10 and Xbox One. If you don’t see your device listed, follow us as we update you on when it becomes available. June 22, 2017, Sling TV Cloud DVR became available for iOS systems, Windows 10 and Xbox One. June 14, 2017, better DVR with an option to protect recordings, also record from Fox channels. On April 24, 2017, Sling TV announced DVR option is available for Apple TV users. On April 10, 2017, Sling TV announced that expands to include Roku and Android users. On March 9, 2017, Sling TV announced that the DVR option is available for Amazon ecosystem users– Amazon Fire TVs, Fire TV Sticks and Fire tablets. 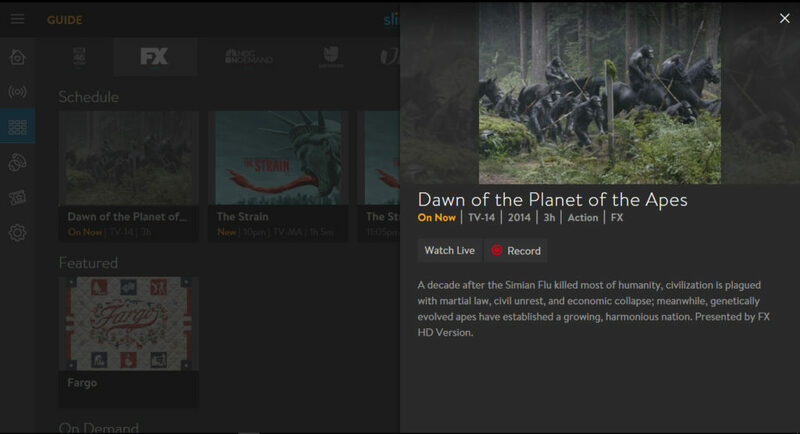 The cost is $5/month for 50 hours of Cloud DVR storage with your existing Sling subscription. If you were lucky to get into the beta program, you get to keep 100GB of storage space without any extra charge as long as you don’t cancel your existing subscription. Not fair? We disagree. Unlike the traditional cable tv business model, you get rewarded for being a loyal customer! 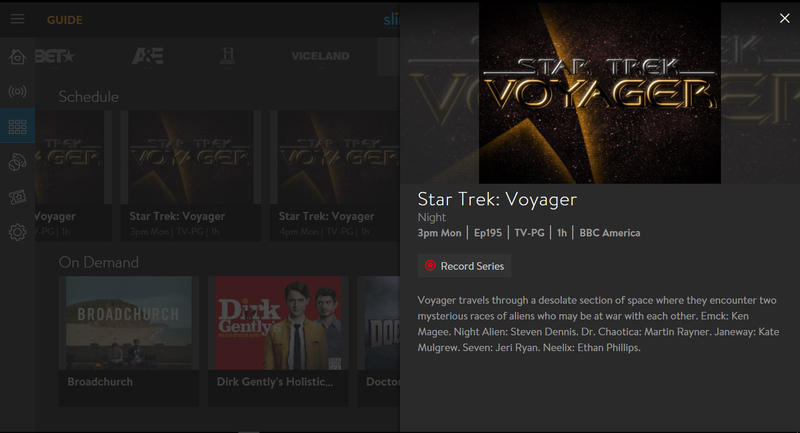 When you access a recorded show, you have the option to record the current show or if it’s a series, the entire series. 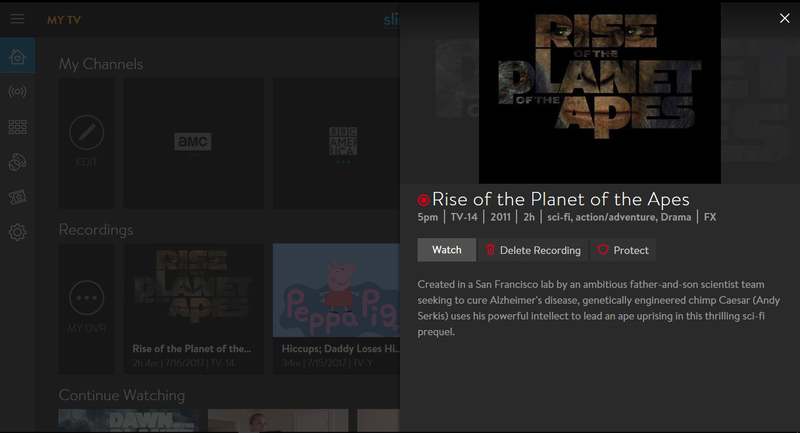 Once the show is recorded, you can access your DVR recordings library by going to the My TV tab. It shows your recent recordings first. If you scroll all the way to the end of recent recordings, you can access all your recordings manager by going to My DVR. You get a bar indicating how much of space you have left. In addition to your most recent recorded shows, you can also scroll through the recordings from A to Z. When your recordings fill up, it’ll start deleting your oldest recordings first, unless you use the “Protect” option, which can preserve your movie or show forever. You can manually delete the recording by pressing the “Delete Recording” option. The best part is that shows recorded from preview channels will still be in your library even when the channels go away. Awesome!